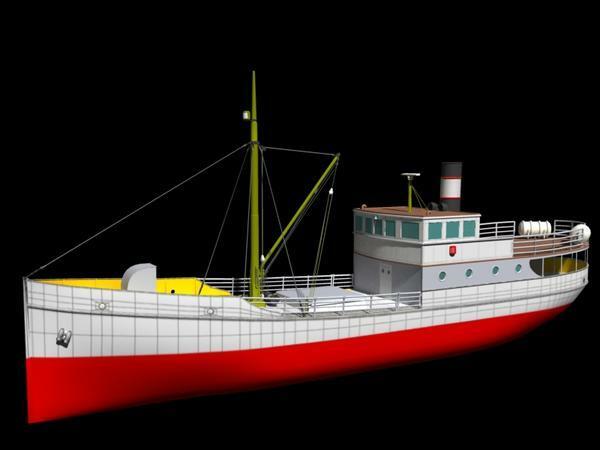 This one is modeled after M/S Granvin, a freighter that used to sail in the Hardanger fjord. It does still sail, but now as a museum ship. It was built in 1931, and was certified for 150 passengers and 3 cars. M/S Granvin never left Norway, but a lot of the old freighters that used to sail along the coast of Norway went out and got a new life elsewhere. This is not a exact copy of the original. A lot of the old freighters were rebuild, and modernized. So I'm building one of her unknown sisterships. The one that went to the Caribbean, and now sails as a freighter under the sun. The modeling is done for now. If I need some more details, I can always add them later. It's partly UV-mapped. I will use it in Carrara, so there will be procedural shaders, but some details have to be made in the texture. It's starting to shape up.. Amassing what a decent shader can do. But now I can see that it's still to clean and tidy.. Need more clutter and details. There are websites which hosts free rusty iron textures or grunge textures , you have to spend some time and search on google. Some are royalty free license which means you can use them to sell your product but you are not allowed to redistribute nor sell the texture as it. Ofc, any new ship will look like this one (freshly painted) but aged ones can look great too with a cool grunge texture at least for bottom(body) of the ship . Give him a chance, he hasn't started to add relevant gunge yet , wear & tear may follow depends how old he is aiming for. He may not have finished adding textures. You can see the original ship her. As you can see, here paint does hold up really well, but she is also much loved and tampered with. Her hull is a bit battered up, from a long and proud service at narrow and small harbors. There are also signs of repair on the hull, and on the wood on the wheelhouse. The original does also have portholes in the hull. There where the cabin for 2.class passengers. It has also five portholes on the starboard side and four on the port side on the upper deck. In my version this has been rebuilt to cargo. Cris333 : some grunge will be added. Also indication on repair and rebuilding, but not to much..
A rust bucket it is not ! Very nice indeed Varsel, amazing piece of modeling. Why does google translate translate "M/S Granvin" as "M/S Granby"? Google has made the desicion about where the importance lies. There is a place in Colorado thats also called Granby, but I doubt they sail ships like this there. Actually, I'm constantly fascinated that google translate works as well as it does. Even when it flubs as often as it does, I can still usually get a fairly decent gist of what's being said. But thanks for the feedback on the Granvin/Granby issue. Since most ships are named after people or places, their names are what they are, and don't require translation (unless you switch alphabets or something like that. For instance, russian "MOCKBa" requires a near-phonetic english translation from "musk-vwah" to "moscow") . So when google translated "granvin" to a different word, it confused me and I just thought I'd ask if something "special" was going on. 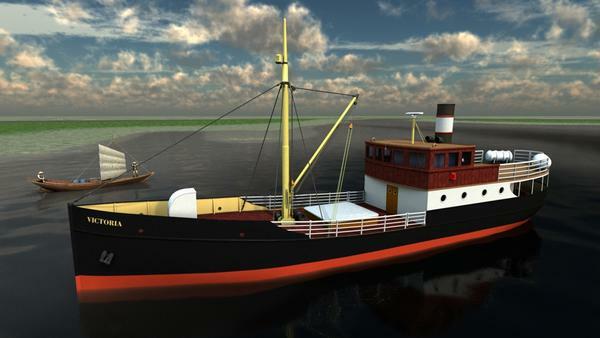 I did try to add some dent and traces of repair to the hull, by a bump map. The effect isn't to good when rendering with a hdri. But then again - it was never intended for closeup renders.. The hole ship is only 32 000 poly's. That has to be next week. 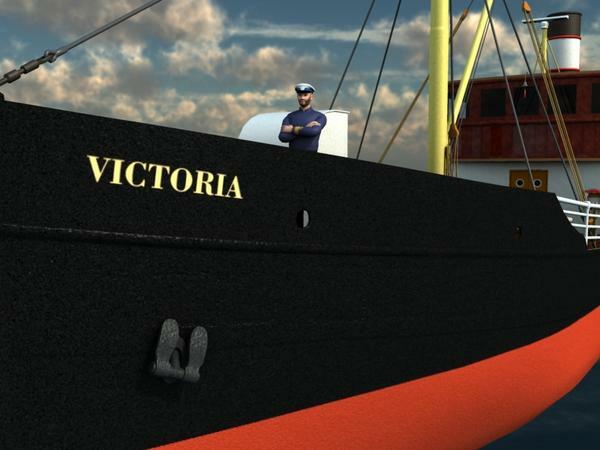 Now it's time to go and make some money, so I can exist in real life..
Not surprising really as the hull is black, perhaps if you introduce an incidence light source to get some highlights you might be able to pick up the dents. lol. Nå blir vi snart kasta ut! Norsk og svensk er vel ikke populært her.